Landscape artists, gardeners, or anyone who is fond of plants will tell you that climbers and runners are a charming group of plants that add beauty to bring about a creative difference to your spaces, be they indoor or outdoor. As the name suggests, these are plants that have a weak stem and therefore grow by climbing on to supports or by trailing on the ground. Many of the climbers that are now used prominently in landscaping and as indoor beauties were once wild plants. There are hundreds of plants that fall under this category, many of them sharing the same environment as us, yet are hardly noticed. I hope to bring to your attention some of these plants which require so little attention to cultivate and also contribute to the health of the environment and humans. Plants of the genus Ipomoea are climbers or runners that have close association with several organisms including humans. 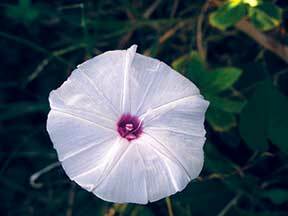 It belongs to the family Convolvulaceae, which is recognized easily by its trumpet/bell shaped flowers. There are close to 700 species of Ipomoea found the world over. They are tropical sun loving plants that can flourish even in poor soils. Their association with humans would appear to be near complete, ranging from their use as ornamental, medicinal, and food plants to their use even in religious rituals. One of the properties of Ipomoea as well as other members of the family of Convolvulaceae is the presence of certain kinds of cells in its foliar and root tissues that store a compound the scientists refer to as ‘glycosides’. Seeds of Ipomoea species contain different kinds of alkaloids, some of them being neurotoxins to both humans and animals. For this reason herbivores generally avoid them, permitting them to flourish well to the point of becoming problematic weeds. History will tell you that Ipomoea aquatica has been used as a vegetable by South Asians from as early as 300AD (some claim it to be in use since 200BC) and that these cultures were aware of its medicinal value. It is believed that the wild plant was domesticated by both Chinese and Indians. However, Europeans discovered this plant only in 1962 and recorded it for the first time from the Malabar coast. They then took it with them. Commonly called water spinach in English, this plant, native not only to Asia but also to Africa and Southwest Pacific islands, is found worldwide. Known as kalamba in Sanskrit, it is called puisaag or kalamai-saag in Hindi, neer-kuzhumi in Tamil and thota-kura in Telugu. Almost all South Asian cultures are aware of their medicinal properties and it was an important ingredient of food in places like Malaysia and Philippines. Considered a laxative, a tonic, in Philippines, an experimental attempt at using a mouthwash made from this plant appeared effective against bacteria such as E coli and S aureus. In Sri Lanka, this plant was part of the indigenous medicine to treat diabetes. There are several other medicinal properties this plant possesses. They are also a rich source of vitamins and minerals. The plant is seen in wetlands in many of our waterways. They grow so fast that in some places they are considered as weeds.